Please send photos in full resolution as Jpegs with minimum compression and no adjustments, text is best with paragraphs but no carriage returns. One of the purposes of this news letter is to upset the workers, even on bad days I say the lift was good and colour the sky blue. If you work with computers put this photo as your desk-top image http://www.ebley.plus.com/limbo/as-good-as-it-gets.jpg it's one of our members on Friday afternoon launching a Mirij, not much to see when it is flying away from you. Thanks to long-term experience of organizing of the World Cup and serial competitions of the Slovakia Championship in F3J cat., we can guarantee nice weather in august. Temperature about 25°C - 35°C. helicopters and World War One planes. Come along to Brean Leisure Park to experience the Model Flyers Special Week between Saturday 1st to the Saturday 8th September 2007. Pilots Briefing, Pilots welcome (including punch), Bring & Buy Sale, and on Thursday 6th September a three course meal held at the Tavern for just £12.50 per head. Once again in this annual event you will find both flying on the beach, on grass strips at Brean Leisure park, and slope souring on Brean Down, plus a whole host of things going on all week. 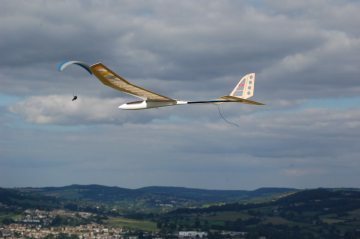 Compact enough for any small park, E-flite's new electric Ascent ARF is the perfect plane for experienced park or slow flyers who want to break into the glider set. It comes out of the box already 90% prebuilt, and the high-quality, lightweight fiberglass fuselage and bolt-on wing guarantees you'll spend less time building and more time flying. It includes a sturdy Speed 400 motor that provides plenty of power. The innovative folding prop eliminates drag and improves aerodynamics. And the Ascent is covered with bright, easy-to-see Fluorescent Transparent Red UltraCote, which not only gives it a striking sheen, but also ensures you won't lose sight of it in the sky. 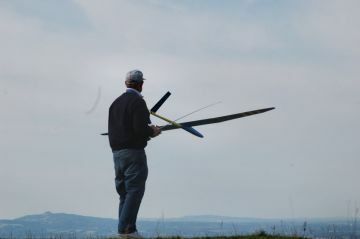 Editor, I like it, very easy to fly, it did tight thermal turns, It had enough power to climb, but if I had it I would fit a cheap brushless to increase the motor run time, keep the weight down and get a faster climb. Monday, moderate lift at Selsley, a little cold, the thermals were strong enough for three paragliders to go cross-country, but most of the time too week for them to ridge soar, giving us the whole slope. 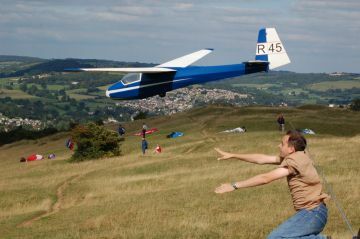 A hang glider got up but hit some nasty sink, he made a safe landing in the landing field. Mike test flew his Ascent see above. Another good day, plenty of lift all day. A bit cold in the morning, someone who could not fly had an elderly Impala that did not want to turn, a very bad combination, still it is only a hobby. We had strong lift in the afternoon with some powerful thermals, Bryan's ASK18 went well, Bill's K8 failed to clear the slope even with Ade's mighty throw. 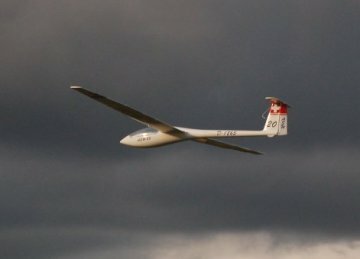 Peter's ASW28 was the star in the evening, high performance from a scale glider. Andy pushed his Calypso round very fast coming down from the thermals. The lift went lighter and very smooth in the evening with a nice sunset to finish with. Plenty of photos on the web site. Richard's HLG, the wind was a little strong for it. Thursday a good breeze in the morning, John flew his Electric Evolution. Strong lift in 15 MPH North Westerly at Selsley. Grey skies and chilly. It will soon be scarf and woolly hats again, god forbid not gloves for a month or three! 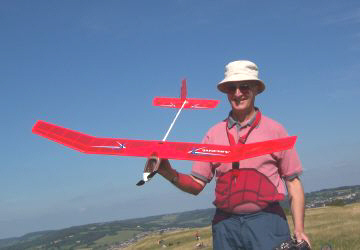 Len G flew his Ash but had to pass over to Alan from time to time (to gain him some height) before the lift improved! Gave us a demo of how the Kamikaze guys dive bombed the enemy by using his spoilers on the landing approach – exciting for us, also for him! Did much better with flaps on his next circuit! Phil eventually arrived, after returning home for his forgotten Transmitter (advancing years impair your memory Phil) with his big ASW-20. 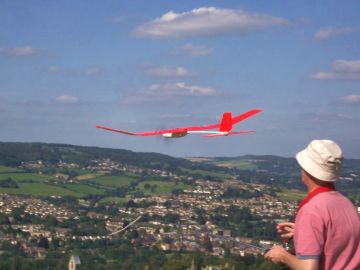 He made me fly it and it is a very responsive machine but very docile and easy to fly. I’m becoming a one plane bore and arrived with the Miraj yet again. It seems to handle all conditions from a puff to a gale and I simply enjoy it more than my other planes. I spent 40 minutes in the excellent air but still need a flight plan to hone my skills, rather than wafting about with the odd roll, reversal and loop. Next trip out will include some square loops and eights and perhaps before winter sets in a rolling circle or two – just for Phil. This was the last show of the year for many people and the last chance to stock up on bits. There were plenty of trade stands and great interest was shown in the craft tent by most of our members. The flying was good with some really big models, it is difficult to judge the scale in the air, but have a look at the ground shots. 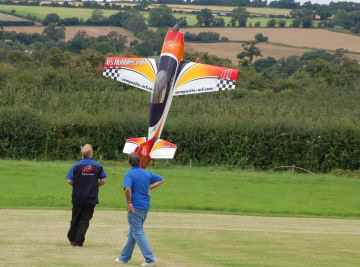 Alan Ester fooled us for long time with his K13, we thought it was full size till it did a landing approach. Star attraction for me was the Roger Beale's Hawker Hind, The grey and silver RAF bi-plane with the rear gunner. I have loaded some photos to http://www.ebley.plus.com/m-marcle/ I will go through them again later and may add some more. The collection of all photos including bad ones have been loaded to. http://ebley.myphotoalbum.com/view_album.php?set_albumName=album06 . Most came out on the dark side but will adjust, many are blurred due the low light, email me if you want one off the album as they do not down load. 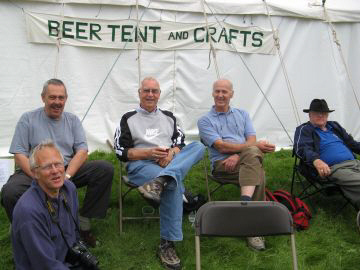 Some of our members at the craft tent My teacher used to say "it's not big and it's not clever".